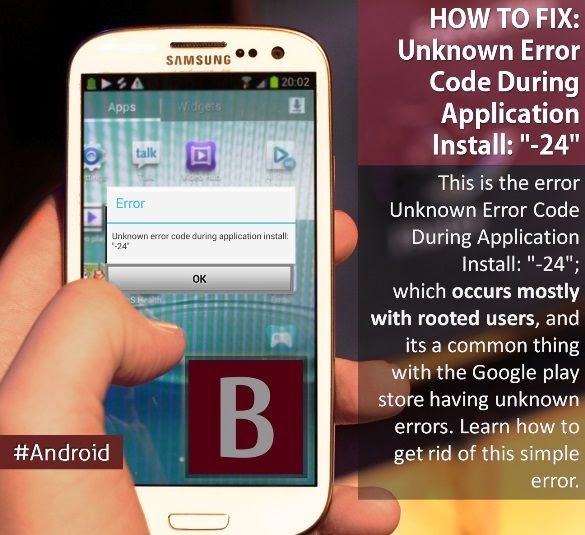 Many android users used to search; How to remove unknown error code during application install: "-24"? How do I fix Error 905? How do I fix google play errors easily? What does error code 110 mean at downloading apps? Fixing Google Play Store Error Code 971? What does error code "-24" mean? Solve unknown error code during application install 504/110? These Android errors or crashes occurring while working on whenever any necessary activity you wanted to do; making all of us very disturbed. And it's the same thing primarily happened with the smartphones & applications, especially in Android. Some of the users also facing the issue of error code 24 when installing whatsapp, and particularly for Instagram download, some might be seen the error message can't install Instagram error 910 and so on. In case, you are not sure what to do after you get an error message in Google Play: "Unknown error code during application install." If you are searching for the way of resolving Unknown error code during application install 24 error message without rooting your android device then you have arrived at the right page. This tutorial shows you to fix -24 error in play store. This error seems appeared even if you have updated your Android OS to new or with any flashed ROMs. This makes annoying & irritating while you are doing an important work on mobile. You must be aware of some Android Errors which you might get during application installation. But No need to worry now, if you are getting this error on Google Play Store, check this fixes shown below. Learn how to fix this "-24" simple error. With the following methods you are not only able to remove the error code -24 but also fixing the error code:0x27fc. Last time you have seen Unfortunately, Touchwiz Home Has Stopped [SOLVED]. That was unrooted phones, but today we are going to see advanced errors particularly rooted devices. With the play store and on rooted devices, when you have flashed ROMs without wiping data, or corrupted installation of apk files, this kinda error appeared on the screen. If you stuck at this error of 'Unknown error code during application install: "-24"' while installing new app, then it means play store didn't remove all its app related files from your mobile when that app was previously removed or uninstalled, and that's why you are not able to install that app again. This problem usually happens if you are using a custom ROM or recently rooted your android phone. Particularly for the Cyanogen mod OS which is not compatible with the Google Apps package. In this post, I'll explain only two methods for fixing error 501 on the Google Play Store. How to Fix Unknown Error Code During Application Install: "-24"
This error occurred when there are same folders already installed or remained still on your device after the last removal and still, you are installing the same app. So the installer doesn't know what to do with this folder and we get an error: Unknown Error Code During Application Install: "-24". These folders are situated in directory "root: data/data" folder [only root users can find this folder]. Go to the root file manager, and navigate to directory: root >> data/data folder. This is a really simple way to get out of this Unknown Error Code During Application Install: "-24". Try it and get rid of your stress.